Earlier this summer when Addy was looking through a catalog and trying to decide on a theme for her birthday party (she ultimately chose Ariel), she found some Zelda plates, napkins, cups, etc. She had just watched Matt "rescue the princess", and she instantly declared that we had to give him a Zelda birthday party. In the weeks leading up to Matt's birthday I had a hard time deciding what to buy him. 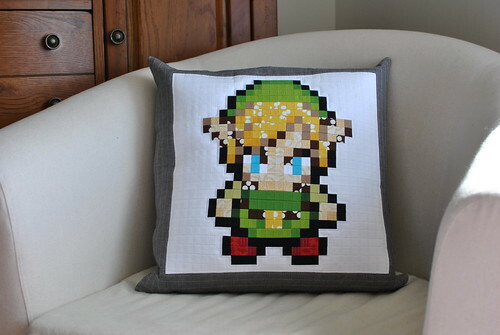 For the last few birthdays and Christmases I have mulled over the idea of making him a pillow of an old-school Nintendo character, but usually I think of it just days before the holiday....and promptly forget about it until just days before the next holiday! Well, this year was the year! In keeping with the theme of his "party" (read: Matt, Addy and I eating dinner and cake off of Zelda plates and then playing some silly games that she made up on the fly), I chose Link! I found the image here, and used that to chose my colors (from scraps!) and place my squares of fabric. I used Quilter's Grid to make the piecing a bit easier. The squares were cut at 1" and finish at just 1/2"! 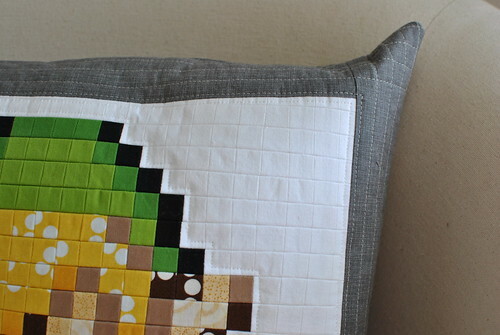 The pillow front is quite heavy with the quilter's grid plus all of those seams, so I simply quilted around Link and added some straight line quilting to the "stone" colored Quilter's Linen border. 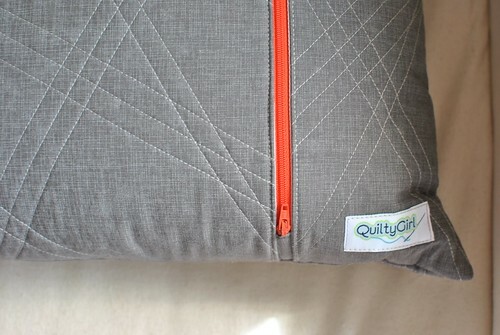 For the back of the pillow I used the Quilter's Linen and added some random, straight line quilting. I love the orange zipper, too! 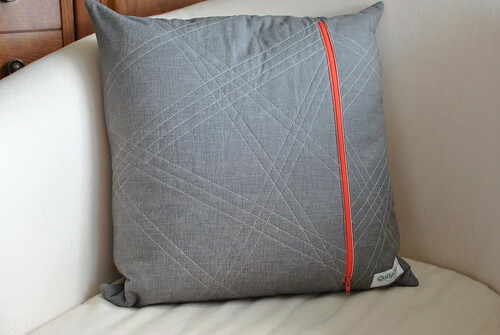 There is no orange in the pillow front, but the color just seemed to go so well! This was one of those projects that took a lot less fabric, but more time, than expected - and I think it ended up being a great gift. Matt is always content with whatever we do for him, but I think this will be a favorite for a long time!